Details! What emitters did you choose? Thanks for the photo! Is it wrong to sleep with my new Titanium HDS? I started carrying mine already. Can't imagine I'll damage it or care about any little scratches it could get from pocket carry. @emarkd. You can tell a lot about a person based on whether their HDS rotary is photographed with the dial on maximum or minimum. You are conservative and thoughtful. Johnnyh is a risk taker. LOL! But you might be right...I just got back from a ride on my Harley with the light in my front pocket...could have damaged it if I dumped the bike! Ha! I'm here all week, folks. Be sure to tip your waitress. Had Johnny pegged. For those of you with inquiring minds my lights weigh, with the appropriate batteries: Rotary with 18650 Tube - 139.2grams, Rotary with 123 Tube - 103.5grams, TI Rotary with 123 Tube - 139.2grams. Clickies were the same at their rotary counterpart. Will I be the only one who carries their new Titanium HDS? I'm being faithful and only sleeping with my Bronze 21 in my hand. When my Titanium 22 showed up today I put an RCR in and dropped it in my pocket. LOL. I’m sleeping with my right hand tenderly wrapped around Brass 14. Wonder what I will do when the Ti enters the scene. Use my left hand to fondle it? Will it be jealous? "Sleeping" is fine, more is, well, questionable. Helluva light!Received mine in an undamaged (!!) box, the HDS unharmed! Great news to say the least. The 325 with great throw, nice beam but, unlike sledhead, I'm not NEEDING an 18650 body---not that it wouldn't be great but, any "staying" power more than a 123 and/or length than my....errrr, THUMB would scare those about me! Yikes!!! Another "duh"---325 Ti primary only or, ...? Been in my pocket since Friday afternoon. Beamed some deer family with it last night, they gave me some freaky shiny stink eye. SW45, sapphire, flush. Loving it so far. I ordered my ti with SW45 and one with high noon but the high noon has already been spoken for. My Naval brass is SN 10 sw40; will be SN11 depending on what happens with the SW35 I have listed. For some reason I opted for one with sapphire and one with clear. I'll just be happy when you all have them in your hands. It's been a long and stressful run. I can only imagine. the whole process was stressful on all of us. but I'm sure your end was almost unbearable. The only one I am waiting on is the titanium which I imagine is planned to ship soon. I know you already started shipping some this past week. For the remaining Ti lights that will sell on april 29th, are they already built and assembled or can you still choose the emitter of your choice and flush or raised tailcap? How did the threads turn out in the Ti, are they smooth? How did the threads turn out in the Ti, are they smooth? Pretty smooth and feel like they'll be even better after having been used for a while. None of the horrible grittiness that we've experienced in so many titanium lights in the past. Not as smooth as my Haiku...yet, but then even it wasn't as smooth as it is now when I first got it. If you go to the HDS Systems Custom Page you will see that you can configure it how you like. You can pick any emitter on the page. I would then suggest you click "unique configuration link" at the bottom of the page, and bookmark that. This will save you time when the event goes live on April 29th at noon Tucson time. I have a feeling the 16 remaining will be sold out in 60 seconds or less from the response of the other sales and the emails we have been inundated with after the presale closed on these. I just wanted to "ditto" Kaichu's report here, because its a common concern with titanium. I've had a lot of different Ti lights, some threads definitely much better than others. I wouldn't go so far as to say that the HDS Ti has the best Ti threads I've ever felt, they're probably not. But they are really really good, very smooth with easy engagement and practically zero slop -- easily in the top few I've had. And they're much thicker and beefier than the couple of lights that stand out in my head as "smoother". So in a way they may be the best -- the best mix of strength and smoothness? However you want to quantify such a thing, in my opinion the machinist deserves some kudos for the work done here. Its really good and should not be a concern for anyone, I'd think. 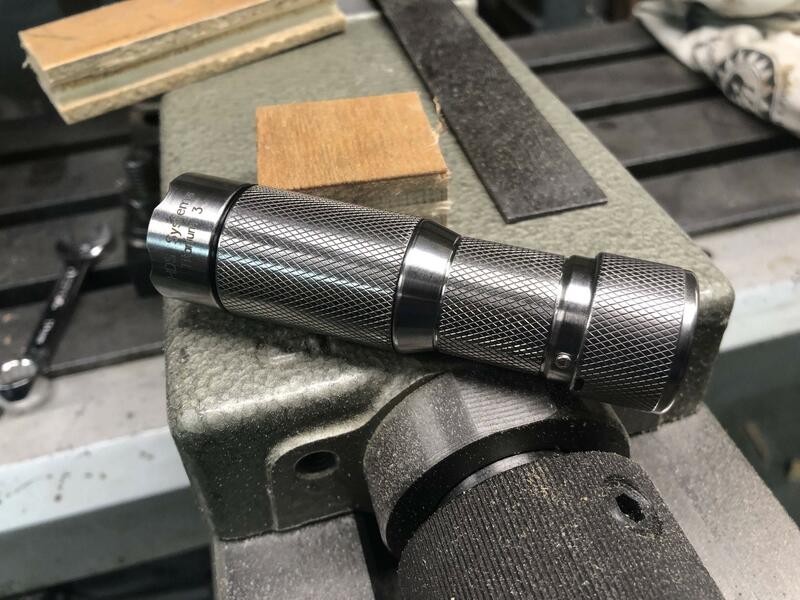 If the last 16 titanium lights are expected to sell out in less than 60 seconds, why not hold a few aside and put them up for auction after the sale to determine the market price. It will give a few of those with not so fast reflexes the opportunity to buy one and raise the value of the titanium lights already sold. No need for a response, just a thought. Last edited by RCS1300; 04-15-2019 at 11:57 AM. Reason: Edit add.. Putting things up for auction is less fair than the "come and get it" approach. Everyone has a chance to grab one. With an auction whoever has the most money always wins. Also an auction doesn't determine market value, it just shows that someone really has to have it. It's also about timing, some things sell better when the timing alignment is just right. I have seen lights among other things not sell as well one week, the next week the same thing might sell even better. The interested parties just have to be around at the right time. Just as when all these special metal runs took place, there were a lot of us here but also many others that missed out. I took a break from here for a little while to stay out of trouble, plus i started a different project. When I stopped back by, i realized I had missed out on some things, just the way it is. That's my $0.02 on this. I'm just glad I was able to get in on the reduced price. If was tough to swallow then, i feel for the ones that pick up the remaining lights. Thanks emarkd, so I don‘t have to worry at all. It really seems, especially compared to the bronze and brass lights, that the titanium turned out remarkably well. For what I’ve seen until now, I am really impressed and the machinist outdid himself on that run. I could bite myself so hard for not getting one in the presale, I‘ve taken precautions so that I don‘t have to work on the 29th of april, so hopefully I can snag one. The link is already bookmarked, I‘m good to go. And I would actually carry it like any other aluminum HDS. Well that’s what I hope, I think they will last a few minutes at least though, but I will be quick about it. I have the sw45 9080 in a regular HDS and it is my favorite emitter. I have never tried the sw40 or sw35, but often I find those lower than 4500k too warm for my taste, and the sw45 has a nice neutral tint and is an allround emitter, for me. Seems a lot of folks think the same as most Ti‘s have that same emitter. that's because we were limited on emitter choice originally, We did not originally have the SW35/sw40 options. Also the SW45 was all the rage at this time and we all wanted to check it out. I think the majority either chose Sw45 or high noon with some that chose some of the emitters that have been a normal option for at least the previous yr and a half. If we all had the emitter choices you will have on the 29th; I think orders would have been a bit different. Also, hogo said that he had a lot of emitter changes on orders and was nice enough to make changes...even though he clearly told us all to make sure we knew exactly what we wanted to order because there would be no changes when the sale happened. I can only imagine all the new headaches he had to deal with. If I knew then what I know now about the current emitter offerings, and if all of them were available at the time of original preorder; I would have chosen SW45 and SW40. although I am happy having SW 35 and SW40 for my bronze and brass lights. However I am really drawn to the titanium even though they are mad money. I'm sure you will be good to go with your order. Can't wait to have mine in my hands; hopefully it will get shipped soon. Is there an acceptable thread lubrication for our new titanium? From what I read, titanium is very prone to galling, even more than aluminum. I am a bit tentative with this light and it seems a bit rough when threading together. Perhaps it is just me. krytox 50/50 is my preferred lube. I just ordered some Christo Lube MCG 111 for one of my McGizmo flashlights. I believe that is what Don uses now. Got some somewhere. Forgot about buying some with one of my lights. Now I have to find it.